1) The frame: Frame could be the primary thing while purchasing a mountain bike for kids. There is no need to have a 500 quid frame but it is must that you do not get a cheap frame. The frame of KCP mountain bike has a hi-tensile steel frame (GW steel). High tensile steel frame can do well whether it is in the mainframe or in the fork. Now a days manufacturers are upgrading the quality of the steel to provide better service. This bike is the example of the upgraded steel quality. You are getting the modern quality product by spending least amount. 2) Suspension fork: You need to have the mountain bike which has fork that is stiffer and easier to maintain. 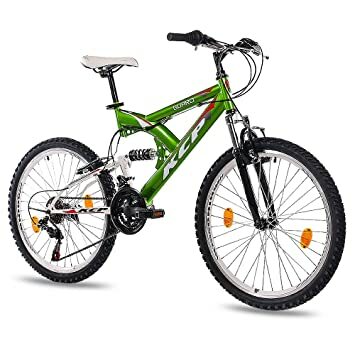 The main purpose of using suspension fork in the mountain bikes is that it can absorb bumps whether it is of small size or large size. So here is the product which can provide you quality suspension fork. In KCP mountain bike you will be getting GW-602 suspension forks which have 56 gq great power to bear any type of bump. 3) Additional features: It has the best quality SL-RS35 3L\6R 18 Shimano speed shifting levers that can give a wonderful experience to the riders. Other than this, mountain bike has the front hub (ASSESS ae241f steel) and rear hub (assess ae241r steel). Hubs can be the best thing to maintain bearing of the wheel. To check the quality of the hubs you can test your bike by spinning the wheel. Front brakes and rear brakes (SACCON v-brake) provide additional safety to the bike. Reflectors of the bike are also well adjusted to prevent the unforeseen problem. The transition component from Shimano is the best quality product for the mountain bike. The KCP mountain bike has the entire component from Shimano only.